Dr. Mark E. Richards helps breast augmentation patients choose implant types, sizes, and shapes to create natural-looking silhouettes that complement their bodies. 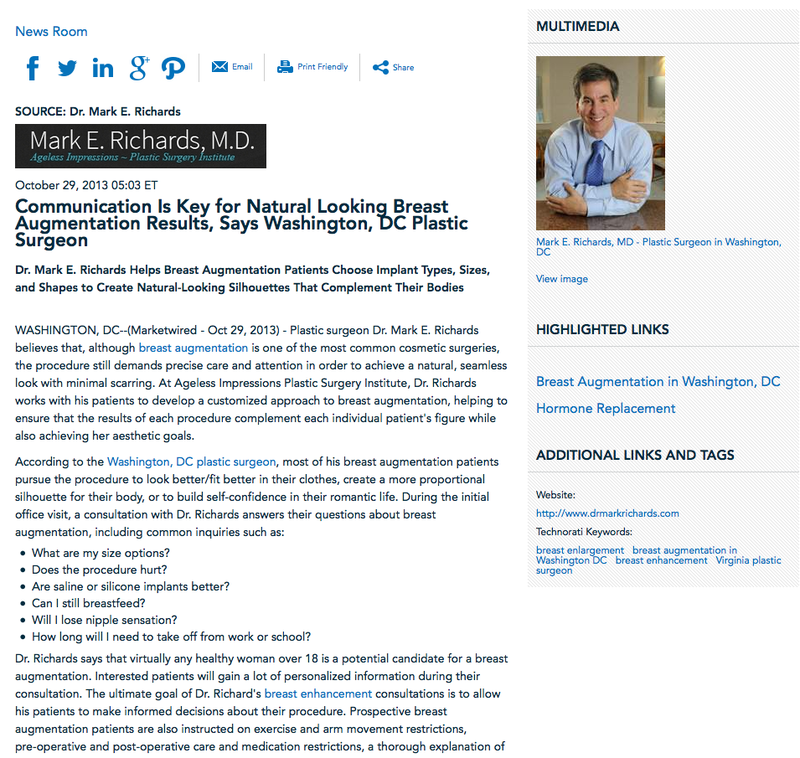 Washington, DC – Plastic surgeon Dr. Mark E. Richards believes that, although breast augmentation is one of the most common cosmetic surgeries, the procedure still demands precise care and attention in order to achieve a natural, seamless look with minimal scarring. At Ageless Impressions Plastic Surgery Institute, Dr. Richards works with his patients to develop a customized approach to breast augmentation, helping to ensure that the results of each procedure complement each individual patient’s figure while also achieving her aesthetic goals. Are saline or silicone implants better? How long will I need to take off from work or school? Dr. Richards says that virtually any healthy woman over 18 is a potential candidate for a breast augmentation. Interested patients will gain a lot of personalized information during their consultation. The ultimate goal of Dr. Richard’s breast enhancement consultations is to allow his patients to make informed decisions about their procedure. Prospective breast augmentation patients are also instructed on exercise and arm movement restrictions, pre-operative and post-operative care and medication restrictions, a thorough explanation of the risks and benefits of each implant choice, and what to expect during a typical recovery. The procedure itself takes approximately two hours and Dr. Richards recommends that a friend or family member be available to take the patient home. He emphasizes the importance of moving around the evening of surgery as well as the following day. During the initial stage of recovery, arm movements should be slightly restricted and patients should make sure to not raise their elbows above the shoulders. Most of Dr. Richards’ breast augmentation patients return to work or school within 5 days after the procedure. Dr. Richards also emphasizes that a special bra must be worn at all times for 3-4 weeks. After 6 weeks, patients can resume their normal exercise routines and the swelling from surgery should be minimal within 2 months. The implants “settle” into their final position slowly over many months. Many of Dr. Richards’ patients report that within 3-6 months, their new breast implants feel like a natural part of their body. Dr. Mark Richards is a graduate of Yale University and received his medical degree from the University of Maryland’s School of Medicine. A board-certified plastic surgeon, Dr. Richards has expanded his practice to include hormone replacement to help combat the unwanted side effects of aging. He has also been recognized as one of Washington, DC’s best cosmetic surgeons by The Washingtonian since 1999. Dr. Richards is available for interview upon request. To learn more about Dr. Richards’ practice, please visit drmarkrichards.com, myhormonetherapy.com, or facebook.com/drmarkrichards.